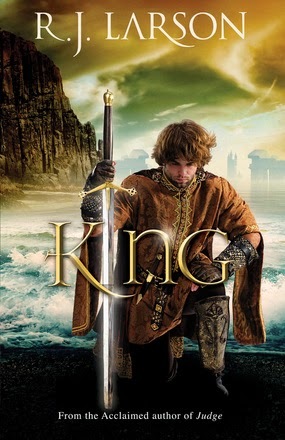 King is a 2013 young-adult fantasy novel by R. J. Larson, the conclusion to her Books of the Infinite trilogy. Here, King Akabe marries into a pagan family to obtain the land to rebuild the Infinite’s temple. The Infinite himself sits most of this one out – that’s kind of the point, but without all the prophet business, the first half or so of the book is little more than a bunch of political intrigue and self-indulgent feel-goodery, and it doesn’t feel fresh. Hand-in-hand with this is the plotting, which is a relatively serious issue here. There’s significant padding, as in the other books; Larson spends time on plots that every reader knows aren’t going anywhere – and then brings sudden and anticlimactic resolution to the series’ ongoing romantic subplot. King has no real overarching plot: the book meanders along without much cohesion, and there’s nothing remotely approximating a climax. All the threat and doom that hung over the protagonist in the first two books is out the window; it’s obvious to the reader by this point that Larson has no intention of following through on any of it. Never mind the contrivedly feel-good ending; in contrast to the first two, there’s not an iota of suspense in this book. While Larson did a pretty good job of not being preachy in Prophet and Judge, King feels a little more sanctimonious as Larson gets her characters proselytizing. Many action scenes are not at all well described, which softens the impact of the book’s events. Larson also continues her annoying tendency to change scene right before the end of a chapter in a cheap attempt to manufacture suspense. On the balance, though, throughout the trilogy, Larson has done an effective job of executing her premise, managing to incorporate God as a character without beating the reader over the head too badly, without making the story too predictable or unforgivably deus ex machina, and without raising too many theological red flags for the Judeo-Christian readership. In this regard, the Books of the Infinite are noteworthy. King, then, is the weakest entry in a generally solid series that started fresh and full of potential and was generally satisfying in that regard, even as it was content to cling exasperatingly to the safe and saccharine paths of young-adult storytelling.